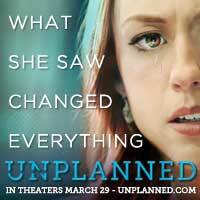 So many people have asked me about the new movie Unplanned. Typically, I am hearing that it is a “must-see” film. Its popularity may even have surprised the producers. While I have not seen it, I understand that it is the story of Abby Johnson, who worked for Planned Parenthood and was so horrified by the cruel reality of the taking of human life that she transformed into a great advocate for protecting the child in the womb. Recently, I listened to an interview with Ms. Johnson and the actress who plays her part in the movie. Both expressed surprise that the movie received an “R” rating, but recognized that such a rating confirms the violent nature of abortion. The interest of so many in the film may indicate something afoot in our culture – a recognition of the horrible nature of abortion. Recent studies about the high frequency of children with the genetic Down syndrome being aborted also may be putting a face on the reality and calling out for alternatives. During these days of Holy Week, we walk the final steps in the life of Jesus. We meditate on the cruel death to the Innocent One, Jesus, who came to save us. Last Sunday, I said the final blessing to complete ”40 Days for Life” in which people throughout the season of Lent pressed and prayed for the protection of innocent children. For sure, a double duty comes when we as Catholics and people of goodwill join to protect a child in the womb. Our first duty is to explore ways in the legislative and judicial arenas, as well as in as the courts of public opinion, to speak on behalf of the child without a voice. Some very positive measures advanced this year in the Kentucky legislature, and I joined with the Bishops of Kentucky in praising these advances. This statement is on the Catholic Conference of Kentucky’s website at www.ccky.org. In addition, we celebrated the restoration by a higher court of a 2017 bill passed in Kentucky, which provides for the use of ultrasound technology to ensure that a mother contemplating abortion makes an informed decision. We have a second duty. We must join this protection of the child in the womb with protection and support of the pregnant woman who in pain has nowhere to turn. Thank you for your support of the Opportunities for Life collection in January, which supports mothers and their unborn children through a variety of programs in the four dioceses of Kentucky. I also applaud the efforts of our pro-life ministries led by Ed Harpring in the Office of Family Ministries, Catholic Charities of Louisville led by Lisa Dejaco Crutcher and such fine groups as Little Way, who serve so tirelessly in walking with mothers in need – offering a true alternative for them and for their child. I also thank each of you who seeks to influence the court of popular opinion so that more and more people in our culture hear the voice of the child in the womb and are moved to defend the innocent. As we walk with Jesus to the cross during these days of Holy Week, we are encouraged and given strength by the grace of His cross and resurrection. May this week be a time to act for life!